To celebrate the inauguration, the clinic will be conducting a ‘Free Mega Health Camp’ from 9 am to 5 pm on the inaugural day. A new branch of Thumbay Clinic and a new Thumbay Pharmacy outlet will be inaugurated in Ras Al Khaimah by His Highness Sheikh Ahmad Bin Saqr Al Qasimi, Chairman of Ras Al Khaimah Free Trade Zone Authority, at 11 am on Sunday, 24th January 2016. The inaugural function will be held in the presence of Mr. Thumbay Moideen – Founder President Thumbay Group, Mr. Akbar Moideen Thumbay – Vice President of the Healthcare Division of Thumbay Group and other members of the administrative team of the Group. The new Thumbay Clinic is the latest addition to Thumbay Group Healthcare Division’s network of state-of-the-art family clinics focusing on personalized services, affordability and convenience. The clinic has Internal Medicine, General Practitioner, General Surgery and Obstetrics & Gynecology departments. The new Thumbay Pharmacy adjacent to the clinic has a wide range of medications from reputed pharmaceutical companies, dispensed through experienced pharmacists. 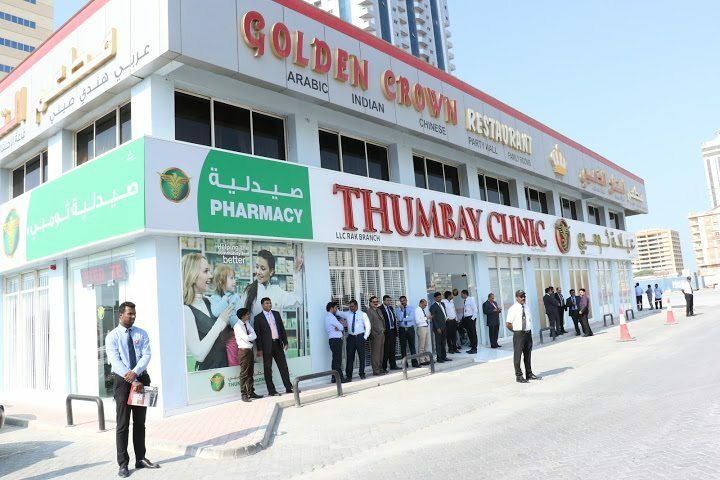 Thumbay Group delivers healthcare services through its four Thumbay Hospitals in Ajman, Dubai, Sharjah and Fujairah, a 25-chair dental hospital in Dubai, five state-of-the-art Thumbay Clinics and Thumbay Labs in Ajman, Dubai, Sharjah, Ras Al Khaimah and Umm Al Quwain, in addition to outlets of Thumbay Pharmacy across the UAE. Thumbay Group’s network of hospitals and clinics are among the largest healthcare providers in the UAE. All Thumbay Group hospitals are full-fledged multi-specialty centers, with wide-ranging tertiary care services. Thumbay Hospitals have been the first choice healthcare destination for patients from over 175 nationalities. Staff from over 22 countries, speaking over 50 languages attend to patients. Thumbay Group has recently announced its plan to open 15 more hospitals in the UAE and abroad, over the next five years. The new Thumbay Clinic is located at Al Jazah Road, Al Nakheel – Ras Al Khaimah. To celebrate the inauguration, the clinic will be conducting a ‘Free Mega Health Camp’ from 9 am to 5 pm on the inaugural day.